Located close to the Kings Cross and St Pancras stations, Casa Mamma offers a ringside seat to the passing parade of shoppers, travellers, and is a welcome oasis during a day of shopping and sightseeing. Casa Mamma is a well-established family run restaurant-pizzeria. Centrally located in Kings Cross, it is very popular for business lunches, as well as for pre-theatre dinners and leisurely evening dining. 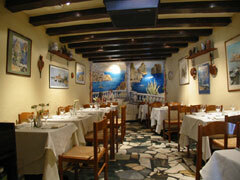 This restaurant specialises in a wide variety of authentically presented Italian cuisines.